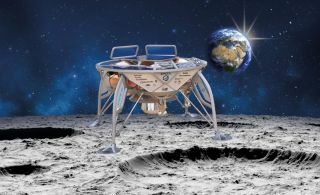 Artist's illustration of Israel's Beresheet lunar lander on the moon: The spacecraft totes a NASA-provided laser retro-reflector array. An Israeli spacecraft is headed for the moon, slated to touch down April 11 within Mare Serenitatis on the northern hemisphere of the moon's near side. Onboard is an experiment, smaller than a computer mouse, that could enable spot-on touchdowns of future robotic and human-carrying landers. The Beresheet spacecraft, whose name means "genesis" or "in the beginning" in Hebrew, launched on Feb. 21. The explorer is a joint project of the nonprofit group SpaceIL and the company Israel Aerospace Industries. Since liftoff, Beresheet has been performing a methodical series of orbit-raising maneuvers around the Earth to place itself into lunar orbit, then attempt a landing. Along for the hop to the moon is a NASA laser retro-reflector array comprised of eight mirrors made of quartz cube corners that are set into a dome-shaped aluminum frame. That array is lightweight, radiation-hardened and long-lived. If Beresheet successfully plants itself on the moon on April 11, NASA's Lunar Reconnaissance Orbiter (LRO) will eventually use its laser altimeter to shoot laser pulses at the retro-reflector. Using this technique, Beresheet's lunar location can be pinpointed to within 4 inches (10 centimeters), project team members have said. NASA is interested in dotting the moon with many such retro-reflectors in the future. These would serve as permanent "fiducial markers" on the moon, meaning future craft could use them as points of reference to make precision landings. The instrument NASA placed on Beresheet, called the NASA Goddard Space Flight Center/MIT Laser Retro-reflector Array (LRA) for Lunar Landers, is located on the top side of the Israeli lander so it can be seen from above. The laser retro-reflector array before being installed on the Beresheet moon lander. LRA is a passive instrument. It will be used in conjunction with LRO's Lunar Orbiter Laser Altimeter, or LOLA. That altimeter's laser beams strike and are backscattered from the lunar surface. For each laser beam, LOLA measures its time of flight, or range. There won't be any attempts to range the reflector from LRO until Beresheet is no longer active on the moon. Doing so ensures that the LRO laser would not damage any sensitive detectors on the Israeli lander, said the Massachusetts Institute of Technology's David Smith, the principal investigator for LOLA and an emeritus researcher at NASA Goddard in Greenbelt, Maryland. Subsequently, LOLA will attempt to make range measurements to the lander from LRO. "This is an experiment to determine feasibility, and it will be possible to continue to make measurements to the array for an indefinite time, or as long as the LOLA instrument on LRO continues to operate, which is approaching 10 years in June 2019," Smith told Space.com. The laser array was conceived and designed by Smith and Xiaoli Sun at NASA Goddard about 15 years ago for NASA's Phoenix Mars lander. "It was intended that it would work with the laser altimeter that we had on NASA's Mars Global Surveyor spacecraft. By the time the lander arrived at Mars, however, the instrument was no longer active," Smith said. The purpose of the Mars and the moon arrays is to try and locate the position of landers from an orbiting spacecraft carrying a laser system, he said. In principle, ranging to the reflector array many times will enable NASA to determine the location of the lander. But the accuracy of this method is limited by the size of the spot illuminated by the laser on the surface, Smith said. A laser generating a 16.5-foot (5 meters) spot on the surface requires very precise pointing of the laser, Smith said. It will be easier for a wide-beam laser to detect the reflector array, but knowledge of the array's location on the surface will be more uncertain, he said. NASA's Lunar Reconnaissance Orbiter will use an onboard laser system to determine its distance from the Beresheet moon lander. "A properly designed ranging system could solve this problem," Smith said. "LOLA was designed to do altimetry, not range to a small reflector array. But it is the only laser at the moon for the immediate future." Imagery taken by the high-flying LRO can clearly identify where Israel's Beresheet sits on the moon. So the Laser Retro-reflector Array is an experiment to see how difficult it will be for LRO to make the range measurements to the lander, Smith said. "A small grouping of these small arrays placed around a landing site, for example, could assist in a lander returning to a location at some future time," Smith said. "Requiring no power, the arrays could be used for decades, possibly longer." The Lunar Orbiter Laser Altimeter (LOLA) instrument, which is carried aboard NASA's Lunar Reconnaissance Orbiter. LOLA will laser-range a retro-reflector array mounted atop Israel's Beresheet moon lander. Smith said there are also potential applications for these small reflectors on other celestial bodies, such as asteroids. Placing — perhaps dropping — a number of small arrays on the surface of a body would allow nearby probes to monitor the object's rotation and position, as well as determine its shape. "Since the reflectors could last for decades, the object could be monitored by other spacecraft on subsequent visits, and of course, would assist in landing on the object if desired," Smith added. Of course, the reflectors' small size limits the range from which they can be detected. Present buildable laser concepts at NASA Goddard could enable measurements from over 6,000 miles (10,000 kilometers) away, Smith said. "These small reflectors only weigh roughly 20 grams [0.7 ounces] but could be much larger and capable of being detected from even greater range," Smith said. "But larger would mean heavier, and one of the attractions of these small reflectors is that they are very low-mass, so almost any lander can carry them."